No happy craft today. Once again horror strikes in my country yesterday. Another barbarian act. Less than two weeks after the Nice attack, where families, kids, pregnant womens, old, young, catholics, muslims, lost their lives in an horrible way, terrorism killed. An unbelievable act, condemn by all communities. A men of peace died, butchered. I usually don't watch TV since the 11/9 to not be overwhelmed by horrific news like I was on this day. But everyday news catch me by social media now. And everyday I'm in tears. I had to create something to express my feelings. So please be clement, I am no poetess, but I had to put words on my creation. Even if they were not sinless born. But someone queried for their drop. For the white roses tainted with blood. 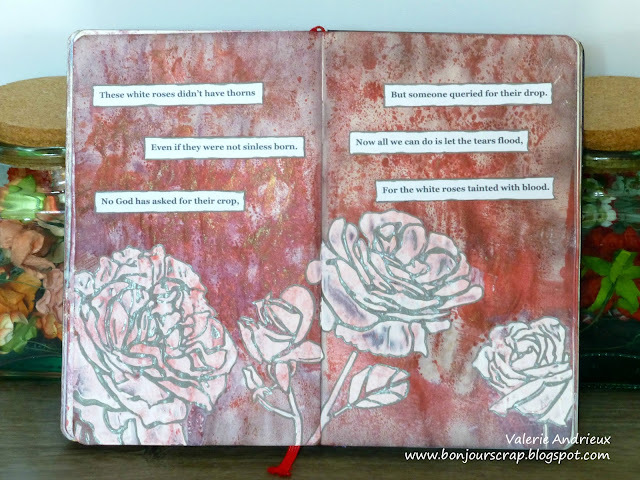 The materials used are pretty simple : Silver Sugar and Santa Baby Glimmer mists by Tattered Angels, roses stencil by TCW, gesso and gray Souffle pen by Sakura. New Prima Marketing card challenge !